Why Do You Want To Be Debt Free? Have you noticed the increased buzz about “becoming debt free” lately? Everywhere we turn, more and more people are talking about clipping coupons, cutting expenses, building emergency funds, etc. This has been especially true over the last year or so. Why all the hype? Why are so many people looking to rid themselves of their debt which, in many cases, they have been carrying for years or even decades? The economy has had many dips and dives since coming out of The Great Depression, but this time it seems different. Many individuals and businesses are cutting back and making changes they’ve never had to make before. 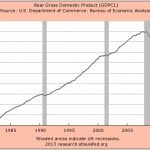 So what makes this recession different from all the other recessions our economy has experienced since the depression ended in the early 1940s? Personally, I see it is a buildup of bad financial habits from those in leadership. Our government has been mismanaging money for a long time, and those poor choices are finally starting to catch up to us. For years now, whenever our country needed more money, the Fed would just print more. Recently, however, international lenders have become privy to (and tired of) our gross financial mismanagement, and confidence in our dollar has dropped. These things have resulted in a very real shift in American economic power, and have further weakened confidence in the dollar as the standard global currency — and rightly so. Freedom from debt puts control back into your hands! This sense of a very large, looming problem is causing more and more Americans to take matters into our own hands. I know that my wife and I have been inspired to act. We’ve had debt as long as both of us can remember, but now we’re doing something about it — and we’re not the only ones! Along with the great consumer crash of 2009, there has been a great consumer savings boom of 2009! It’s true. Since the 1st quarter of 2008, the personal savings rate has risen by 5x to it’s highest level this decade. Not only that, but people are cutting expenses and looking to create alternate sources of income as a hedge against job loss. In my opinion, this recession has had a very positive impact on America. Most Americans were living way above their means… Just like our government. Facing hard times every once in awhile is a good thing, as it helps keep us on our toes and helps us maintain a proper perspective. Getting out of debt is a personal journey. It will be, and should be, different for everyone. For my wife and I, this Debt Free Adventure has been an awesome experience. Because we are in our early 30s, we’ve never had to live through a large scale economic downturn as adults. The events of the past few years, and the changes that we’ve made, will affect us in a positive way for the rest of our lives! We plan to never abandon the solid financial principles we’ve learned. Have you recently developed a strong desire to become debt free? Why are you seeking freedom from debt? What do you plan to do when you achieve debt freedom? I want to be in greater control of my own daily life and I don’t want to be a servant to anyone else. I never plan to retire. Instead I plan to work on my passions at my leisure. Currently, those passions include – blogging, teaching, and speaking about personal finance, true healthy living, and self-reliance. I plan to have enough money in the bank to allow my family and me to live a humble and modest life off the interest, then give the rest away. I hope you will share why you want to be Debt Free! @Red Oscar: What you have just said about having cable TV, cell phones, iPods, and expensive clothes is EXACTLY what my next article on FCN is geared toward… I’m guessing you will love it! The article will come out on Thursday. I agree completely with what you have said. In the 40 years since I got my first checking account, I have never had a check bounce or paid a bank fee for checking or ATM usage. The only time I have ever paid interest on a credit card was when I did an ATM cash advance so I could pay cash for a car purchased in 1990. How was I to know that “cash advances” always get charged interest! Here I thought I could use the bank’s money for 30 days for free and just pay them back on the next billing cycle. That episode taught me a valuable lesson (never do ATM cash advances) and I paid that debt off immediately. When we were first buying furniture and appliances, we always did 90 days or 1 year same as cash; whatever the store payment promotions were. They always hated us when we would come in to make our payments and never pay a dimes worth of interest. I truly feel sorry for people who get themselves into bad situations and have to borrow money for daily needs. But if these same people subscribe to cable TV, or pay $50/month for a cell phone, or have an iPod full of tunes, or wear $100 sneakers, I don’t feel quite so sorry for them. It’s just so sad that so many people have such poor money management skills. It’s hard enough being in control of one’s destiny. Don’t make it worse by always being in debt! The first reason would be to take the pressure off. If you owe nothing, then your money and time are much more your own; you are in control. We paid off our mortgage after 15 years of scrimping and saving and it has been a great feeling these last few years. The second reason would be the added cost of being in debt. If you borrow to buy something, you have the same thing as the person who paid cash, but you are paying more for it, and if you borrowed on your credit card, you are paying a lot more The higher the interest, the more you pay. This just seemed wrong to me. The third reason would be one of principle. On principle I do not want the bank to make money off of me. I strive hard to have no banking costs. I will walk or drive to the bank machine of my bank so that I do not pay a service charge. I never get NSF items and I keep enough in my account to get free banking. The few months I slipped up, cost me about $15 each and I resolved to be more diligent â€“ no fees in over 10 years. Fourthly there is the issue of discipline. To stay debt free, I have to save up for the item before I buy it. This is a great discipline, and in time, it turns out I did not really want the item in any case. I work hard to earn the money and I want to make sure that I only buy the things I truly need. Every dollar I waste is a dollar I am not saving for my retirement. For me that goal is so important that it helps me focus on those things that I truly need, rather than just want. For the past few years my wife and I have been totally debt free and it is a fantastic feeling. We bought a used car this year to replace our 14 year old mini-van. We paid cash. We have lived in our current house for 13 years and just finally had the bathroom renovated. We paid cash. Living debt free is not about missing out; it is about spending money on those things that truly matter and about getting the most out of your money. @Ellen: I totally agree! It is awesome to hear that the light at the end of the tunnel truly does shine warm and bright! I enjoyed hearing your personal testimony that a debt-free life is possible. You set a great example of how budgeting and living within your means can lead to a happy and fulfilling life. It’s inspiring. These days, debt is a tool. After 6 months of unemployment (and living off credit cards to some extent) I have a goal to be revolving debt free by January. It looks like I will make that goal. Several years ago, when I had just graduated with my BS, I was working at what was essentially a minimum wage job. I had credit card debt, a car loan, and rent. As much as I may have even wanted to switch jobs, I was too poor to quit because the gap in paychecks (no matter how hard one tries to time it right, there is just no continuity in income stream when switching jobs) would have pushed me over the edge. So why become debt free? I learned way back then that one becomes debt free so that one works for himself, not his creditors. I began to get serious about debt freedom about a year ago when my one year older sister announced that she was retiring. I’ve never been in deep soul crushing debt, but still carried credit card debt and barely paid more than the minimum each month. Her announcement was the kick in the pants I needed to start getting serious. I didn’t know the term “Debt Snowball” at the time, but that’s what I started doing. In January I read Rich Dad, Poor Dad and while doing some research into Robert Kiyosaki discovered Trent Hamm’s The Simple Dollar. The rest is personal finance history. 31 months to TOTAL debt freedom. i’m in favor of some debt so long as you can afford the debt. i think once you get beyond a certain point, you can use debt responsibly and to your benefit. We had more than enough cash on hand to pay for a new car in full, but why would we since we are earning more on the cash than what we are paying in interest on the car loan? things like that. however, i would be reticent to do so if i couldn’t afford the debt. i think being debt free gives you the flexibility to do things which you might not otherwise be able to do. whether it be retirement, buying something, etc. By increasing income and income sources! There’s a lot of talk about people being in debt because of living above their means, and there are plenty of people in that category. But I think at least an equal number are in debt because they used debt to cover lost or declining income from a job loss or other income reduction. Income is the key, and that’s where I’m focusing. I’m seeking freedom from debt because of an offhand comment someone made to me a few years ago: “as long as you have debt your money isn’t your money”. That single comment drove me to evaluate my spending, my saving, my investing, everything in my financial life, and it’s saved me literally thousands of dollars since. How I pay my debt is pretty straightforward: automatic transfers at the beginning of the month, don’t put things on the credit card unless they can be paid off before the due date (I just love collecting those points! ), and add the difference in interest between the current month and the previous month to the payment since I’m used to not having the money anyway. What I plan to do when I achieve debt freedom is to take my wife on vacation. She’s a great sport about all this and has been very supportive of the decisions I’ve made. I try to involve her but her eyes just glaze over and we end up laughing too hard to get anywhere. She’ll definitely have earned the break by then. After that, the money that was going to debt will be equally split between savings and investments in hopes we can retire early. I had lot of savings and investments, and then I bought a house. I guess I don’t like outstanding debt, so am rapidly paying it down. It might have something to do with my old school bringing up. Why debt freedom? I value freedom. I love being able to walk away from a job if I want; I love being able to help people when they need it. The next step is owning all of my own time. Just like we have been – keep the fixed expenses low, spend less than we earn. We’re on track to be completely out of debt, mortgage paid off, in just under 9 years. My partner will be 40 and I will be 45, our son will be 13 and unless the stock market tanks again between now and then his college fund will be pretty much full. What will we do? Who knows? Anything we want. It depends a lot on the health care laws, actually – we can’t stop working til we know what kind of health costs we’re going to have and how they’ll be covered. Because it disgusts me how much money I’ve made, yet how strapped I became. We stopped borrowing, we are living on much less, and creating new income streams without taking on new debt. I like your comment about not worrying what kind of car you are driving. I am the same way. Until Cash for Clunkers, I was running around in a 1990 Astro Van and a 1992 Acura Integra. The wife drives a 1997 Grand Am. My C4C replacement for the Astro was a Dodge Caliber costing right at $11,250 including tax, title, etc. Sure we could have afforded much more, but why increase the daily burden of living any more than necessary. All we really wanted was to have a car with working air conditioning once again. If you are not burdened with debt and build up some savings, you can take advantage of opportunities like Cash for Clunkers when they come your way. I’ve never been in substantial debt – I had a scholarship and only had to pay for 1 years’ worth of Higher Education Contribution Scheme and have never had a credit card. But I bought a house this year, and going from $0 debt to $390k debt is unfamiliar and unpleasant. How do you plan to get there? Slowly and steadily. I could only afford the price I paid by getting the rate fixed for 5 years, so I’m limited in how much I can pay off early during that time. I’m going to make the regular repayments, pay of the $20k extra I’m allowed to make in that time without incurring extra fees as soon as possible and then save. What do you plan to do when you achieve debt freedom? When I have debt freedom or reduced debt I plan to quit my career and either live from my other pursuits (illustration & writing) or go overseas as a translator. I don’t want to be debt-free at all. Actually, I want as much debt as possible assuming the after-tax cost of debt is below my expected return on savings/earnings. I’ll take locked-in low debt rates (fixed-rate mortgage, student loan) over paying down any day. We decided back in 2007 to get debt free: I think the reason was that even though we made decent money, we were still broke! We liquidated savings, and sold some stock to kick start our debt payoff — yep, really stupid to be investing in stocks and have consumer debt at the same time. Immediately (within a month) CapitalOne started jacking with the terms of our credit card (raising rates, etc), and then we knew: no more debt for us. CaptialOne actually gave me a huge push to get out of debt even faster. We were able to eliminate all of our student loans, credit cards, and automobile debt within 12 months. We just recently fully funded our 6-month emergency fund (it takes a while to build that sucker up). I still drive a 13-year old POS (wife’s car is 5 years old), but I don’t care. I know I have enough money aside to fix it or replace it. I see people buying these brand new $30k cars, and am just amazed! These people don’t understand that you need to be RICH to be able to afford the amount that those things depreciate. The majority of them are upside-down on the loan as soon as they drive off the lot. Well, I’m glad a lot more people are getting on the ‘debt-payoff’ bandwagon — just wish everyone didn’t decide to do it at the same time! My journey actually began 8 months before that threat arrived, and I’m glad. I’ll be “debt free” in a few more months and then I don’t have to worry about how to pay the immediate bills should it happen. Enjoyed reading your article. A lot of persons have now come to realized what having financially freedom really mean. Being debt free then one will has this freedom. Freedom meaning that he/she owes no one and he/she having money to help his/herself. Maintaining a debt free life also gives one a stress free one too. I agree…the success stories are very good to hear. I am more of a glass half full guy and the wife is half empty sometimes. But it drives me crazy to hear “we will never pay off all this debt”. Because I know we can, it will just take time. Keep the responses coming… I am loving these testimonies! Especially from guys like Red Oscar who has already done what a lot of us are trying to do! Freedom! My wife and I have built up roughly 50k in credit debt and we are sick of it. We sold our house over a year ago and live in an apartment now. I have become more strict in our budgeting lately and starting paying myself in advance monthly for bills that will be due only once or twice a year(insurance, timeshare fees, christmas fund). Also we have begun a snowball method and I hope to have my 1st card(and smallest debt) paid off by december. After that its on to our highest %(AMEX). We actually started paying off our debt a year ago, but some big expenditure(taxes, car problems) keeps popping up to set us back. I’m hoping better planning will prevent these setbacks. Why are you seeking freedom from debt? I want control over my life, the XXXX put towards debt every month is a way for me to take control later on. What do you plan to do when you achieve debt freedom? Put that money to work for me! 1. Debt shackles freedom and choices. You give ownership, partial or otherwise, of yourself, your abilities and resources to an establishment, group, or person. 2. Selling the house is the last step. We have no other oustanding debt. I am looking for freedom from debt because Im tired of realizing how much im paying now for the fun I thought I was having then. It’s not as fun now as it was when I was having it, and sure wasnt worth the interest. I have begun to throw every last cent I have towards my outstanding debt, and it has been working quite well. I hope to be free of my credit-card debt by dec 31, 2009. When I achieve debt freedom, Im going to save for the things that I used to go into debt to buy, and It will be glorious when I can pay cash for them. People want to be debt free more now I believe because reality has set in about their financial future. Expenses are increasing, taxes increasing, but job security and salary are not. Debt is worse than before and the hassles with it can ruin people. It’s more important now than ever to get on the right track. I wanted to be debt free because I hoped to retire by age 55. Mind you, this was in 1977 and I had only begun my work career in 1974. By 1989, we had paid off our house and were free and clear of any debt. For the next 11 years, we saved like crazy. We raised two fine boys, and when it was time for them to go to college, we were able to pay cash. If we needed a new car, we could pay cash. When the company made me available for early retirement in 2000, I was able to take them up on their offer. I retired May 1, 2000 at the tender age of 48. The last 9 years have been pure bliss, and I wouldn’t trade it for the world. Take it from one who has been there; it can be done, and it is worth it. I started my debt free quest on November 15, 2007. I had never heard of Dave Ramsey and didn’t know that personal finance blogging even existed. I can’t remember the exact reasons for making the decision. I just remember being tired of it all. I was sick of working all the time and having nothing but a growing pile of bills to show for it. I made decent money, yet I was broke and my finances were a totally unorganized mess. I finally sit down with my list of debts and came to the conclusion that things didn’t have be that way and that I was going to lose it all if I continued down the same path. I installed Quicken on my computer and the rest is history. I’m totally debt free now besides my mortgage and school loan. It’s funny looking back at it now. I thought I was doing something different – almost revolutionary. I considered myself “unplugged” from the consumer-driven system. Turns out that I’m really not that different after all – it seems to be a growing trend. It could be that many people have chose to shed their debt due to recession fears or b/c gas prices kicked their butts last year. Or it could be that they did it for some reasons I did… They were just sick of living that way. Ten years of having whatever you want whenever you want it regardless of cost has gotten old. It’s a great thing. Although I have to admit it – I liked it a little better when I thought I was one of the few people living this way. I mean… Who am I supposed to brag to and make fun of now that everyone is becoming debt free?